We always hear complaints about the new car buying process being antiquated and "old n' busted." 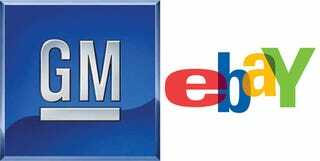 GM's apparently seeking to change that as it emerges from bankruptcy by partnering with eBay for new car auctions. We're told by GM CEO Fritz Henderson that it's "just an experiment." But they are "really excited about it." So no idea yet as to whether it'd be for all vehicles, whether it would be for just a select few vehicles. The biggest hurdle such an idea faces is the dealer network. More than likely the line in the press release of "testing this and other ideas with our dealers over the next few weeks" indicates it'll more than likely be the dealers who'll be providing these services as opposed to direct-from-manufacturer sales. Either way, as long as the consumer experience is eBay-like, it won't matter to them as they'll perceive it to be direct-from-manufacturer — which is often how they perceive the experience now.